Regardless of your dog’s size, it’s probably clear for every dog owner that your pupper needs a certain amount of physical exercise on a daily basis. But how much is too much? And how long can a small dog actually hike? Can I take him to day long hikes? If you are an outdoor loving person like me, you might have asked yourself these questions before. When my miniature poodle Baloo was about a year old, I started wondering if I could also take him on longer treks or even hikes in the mountains. Given that he is a very energetic dog, I thought it would just be a shame if he had to stay at home whenever I would go on a one-day or even multi-day trek. To many people’s surprise, hiking with a small dog is totally possible. If some precautions are taken, it is no problem for a small dog to hike for several hours per day. However, the trek should not be more than 5 or 6 hours in one day. How do you get your dog to do that? Here is a preparation guide to get started. Note: In general, there is no big difference between a small breed and a large breed dog. For large breed dogs you might have to consider joint problems so your small breed dog might even be able to go on longer walks. And in case you’re wondering, why I’m not writing about how far a small dog can hike, here’s why: You should always think in terms of time and not of distance. Because if you are hiking in the mountains, 10 miles (16 kilometers) are much much longer and more strenuous than 10 miles on flat terrain. If your dog is under 1 year old, he’s not ready to go on longer treks or hikes, yet. As a rule of thumb, a puppy is allowed to walk 5 minutes per month of his age at a time until he’s about 1 year old (for small breed dogs). Until then your dog’s bones and joints are still relatively soft and longer walks can harm his health. If your doggo has just surpassed his first birthday, you still shouldn’t rush the hiking training. Start slowly with the preparation (see below) and when he is about 1.5 years old, it should be fine to go on a first full-day hike. On the other hand, if your dog is over 10 years old, he will probably neither be able to go on as long walks as a younger dog. Some breeds are physically unable to partake in hiking or other demanding exercises. For instance short-nosed breeds (e.g. French Bulldogs or Pugs) have shorter airways which can lead to them overheating very quickly. It is generally recommended for those breeds to only walk 30 minutes at a time. Very short breeds such as Chihuahuas and Pekingese will probably also not be able to walk for several hours because they lack the muscle structure that is required for demanding walks. And lastly, dogs with short legs and long back (e.g. Dachshund) need special attention because climbing over obstacles or jumping off them can significantly hurt their backs. However, there are always exceptions. Especially if your dog is a mixed-breed, it is very well possible that he’s perfectly fine with hiking. On the other hand, terriers are generally very active and energetic dogs who will love to come on hour-long hikes with you. Same counts for Poodles, Corgis and of course Shetland Sheepdogs. Check out my list of the 7 best small breed active dogs. Just as humans, not every pup likes long walks. Some are couch potatoes and simply prefer staying inside, sleeping and cuddling. If you are not sure, yet, if your dog is the hiking kind or not, just start with steps 1 and 2 of the preparation. You will surely find out. Before you plan on going on a longer trek or hike, please visit your veterinarian well in advance. She can perform a health check and tell you if your small dog is physically able to go hiking. Also, she can help you set up a training plan if your pup is still young or not used to long walks. Please consider that this post only acts as a guideline. To confirm your dog’s abilities, always talk to your veterinarian! Just as for people, your dog also has to get in shape. If your dog is only used to walking for about 30 minutes at a time, he’ll have a hard time coming on a multi-hour trek. So start with slightly longer walks, an hour daily, then on certain days of the week two or three hours. Eventually, your dog will have no problem keeping up with you even on multi-hour walks. That’s when you can follow through with the next step: more difficult terrain. So just take the same length of the longer walks that you have done on flat terrain and go to a slightly steeper or more stony area. If your dog is used to going on 3 hour treks or more on strenuous terrain, it should be no problem to take him even on a multi-day hike. But keep in mind that your doggo needs continuous practice. If you wanna go hiking on a regular basis, then also do regular shorter (hourly) exercise walks on different terrain. Note: some dogs are fitter by breed than others. Miniature poodles, for instance, can do multi-hour treks without much exercise because they are constantly so full of energy. On hikes they are happy when they can finally use it. My poodle Baloo can easily come on a 5-hour trek and run up and down the whole time and still have energy in the evening. Others might need a little more practice. Another important preparation exercise is to practice overcoming obstacles with your dog, such as walking over different objects (boulders, ramps or bridges), jumping over logs etc. or walking on small paths. Ideally you could already train overcoming obstacles in your dog school. If not, agility training is also a good way to practice. If your dog is a rather timid one, just start by walking through the woods and try to take every obstacle until your pooch masters them with ease. Please always respect your dog’s abilities and don’t force it. 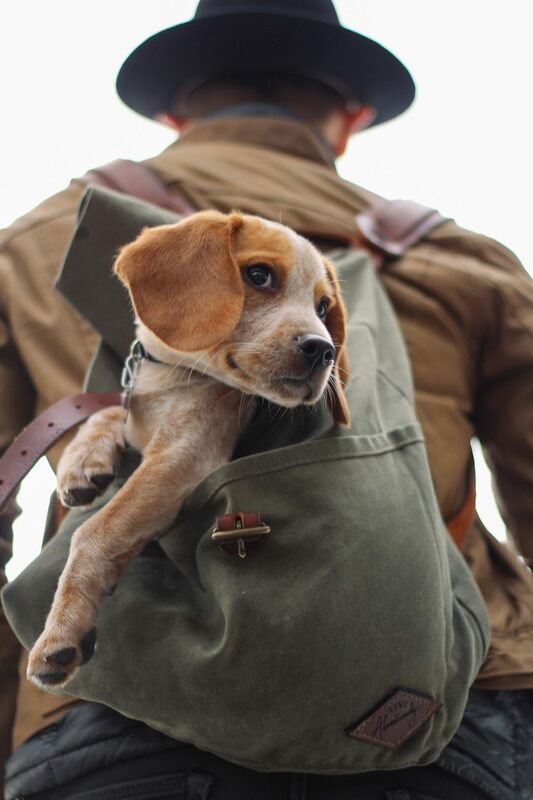 If you’d like to bring your furry friend along, even if he isn’t the hiker kind, a dog backpack carrier is the perfect solution for you. It is important to note that many dogs won’t stop when they’re exhausted but will continue to try and keep up with you. Therefore, you must watch out for signs of weariness, such as excessive panting, wobbly legs or if they are far behind you. In this case consider taking more or longer breaks or simply carry him in your backpack for a while. Since your dog will consume a lot of energy during a hike, it is important to have the right food with you so that your dog can refill his batteries. Please consult your veterinarian for the right kind and amount of food for hiking trips. Of course you should also always have enough water for you and your dog, especially on warmer days. I really like the foldable bowls for your pup’s meals. They are so convenient, lightweight and don’t need a lot of space. Before you go on a hike it is essential that your dog knows some basic commands. Even though your dog has to be on a leash on a lot of trails, I prefer it much more if he can go off-leash. This way he can sniff around wherever he likes and go at his own pace. Where off-leash hiking is possible, it’s crucial that your pupper knows some basic commands like “come back”, “sit”, “lie down”, “stay” and “walk next to me”. These commands should be trained on walks before you go on a hike. And also if he’s walking on a leash, it is much more comfortable if your dog knows how to behave. Especially with small dogs, obedience training is sometimes neglected. If you plan on taking your furry friend on your adventures, like hiking, I strongly recommend to start training today rather than tomorrow! If your dog is semi active it’s probably better to choose a less demanding trail. If you have a super active dog like Baloo, you can easily go hiking with him in the mountains. We have been hiking in the mountains on numerous occasions and, believe me, he’s much faster than me, climbing and jumping over rocks and boulders as if it was nothing. Another important fact to consider is the weather. In summer it is usually fine to go hiking in the mountains because it is much cooler. If it is over 77° Fahrenheit (25° celcius) and the sun is shining, your dog can overheat quickly. So make sure to walk in the shade (for instance in a forest) as much as possible, take enough breaks and let your dog drink repeatedly. During the colder seasons you have to watch out that your pupper isn’t getting cold. He should never be shivering. If you plan on trekking or hiking on a rainy or snowy day it is best to bring a coat for your small dog along. What are your experiences? How long can your dog hike or walk? Is he getting tired very quickly or is he jumping around like a kangaroo?